Shop online, by phone or fax - you choose when and how! We will mix & match up to 6 products per case at no extra charge! 25 Flavors to Choose From! 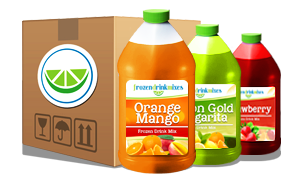 FrozenDrinkMixes.com is a specialty distributor of the best frozen drink mixes for your bar, restaurant or frozen drink machine rental business. Our products are used throughout the United States by professional establishments seeking great flavors, fast service and unbeatable pricing (.01¢ per ounce! )We encourage you to try one or more of our flavors and taste the difference for yourself. With our easy online ordering you can mix and match up to 6 products per case for your convenience, at no extra charge. 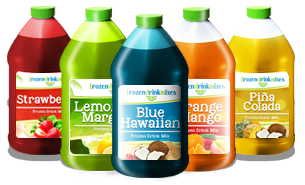 FrozenDrinkMixes.com products are intended for use with Granita and other drink machines like Faby, Frosty Factory and Crathco. Customers who try our drink mixes switch to our products - they simply taste better. 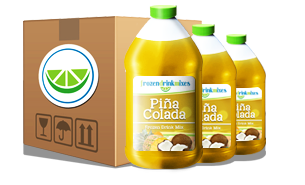 Not only are they better, but they contain real fruit juices and are easy to store, use and serve.We ship cases containing six 1/2 gallon containers of concentrate. These containers yield from 3 - 5 gallons of mix depending on a 5 to 1 or a 7 to 1 ratio. Mixing instructions are on every bottle. All of our products are Shelf Stable - store them anywhere! No refrigeration needed for storage.